Are you a morning lark or a night owl? Do you enjoy rising at the crack of dawn, doing your best work when the day is young, and then winding down after the sun sets? Or are you more inclined to sleep in, only to gain energy as the day progresses, preferring to work and play at night? You may identify with one of these two sleep “chronotypes” or you may fall somewhere in between. Personal chronotypes aside, today’s lifestyle, with artificial lighting, irregular work schedules and erratic eating patterns, can disrupt the natural daily cycle even further. *4 So even if you do not have the morning lark or night owl gene variations, it is still important to honor your circadian rhythm for a healthy balanced life. Humans have evolved to be active during the daylight hours and to rest when it is dark. Our physiological processes reflect this pattern and perform different functions during various times of the 24 hour day. However, modern technology now allows us to eat, sleep and work anytime during the day or night. This can cause a disruption in the natural diurnal cycle. What can you do to support your chronotype? 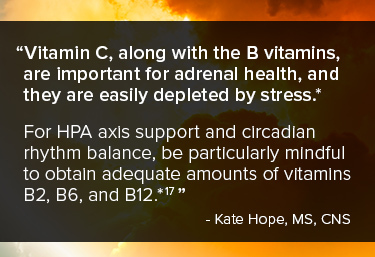 Optimizing the HPA axis through nutrition and lifestyle measures can reduce stress and allow for better sleep and improved health. The following are some suggestions to get your circadian rhythm back in sync. For the rest of us, and especially those who choose very late sleep onset, bright lights should be avoided in the evening. Try to make your bedroom a sleep sanctuary. When it is time for bed, turn off electronic devices, ensure that it is quiet, and eliminate any extraneous light. Blackout curtains can help keep your room dark. There is evidence that eating meals within a narrow window (8-12 hours) during the day may support weight management, and can better regulate leptin and ghrelin levels (our hunger and satiety hormones). *13 Eating a hearty breakfast which includes protein, and saving carbohydrates for later in the day, may allow you more consistent energy and can help you sleep better at night. If you’re a night owl, just make sure you don’t pack in loads of extra calories during the wee hours. Whether you are a morning lark, a night owl, or another one of our fine feathered friends in between, pay attention to your natural tendencies for sleeping and waking using lifestyle modifications, appropriate timing of diet, and supplement interventions when necessary. Kate Hope is a Board Certified Nutrition Specialist with a Bachelor of Science in Biology and a Master of Science in Applied Clinical Nutrition. She has been a science educator for two decades, teaching children as well as providing professional development for teachers. Kate is a nutritionist for Atlantic Medicine and Wellness in Wall, NJ, and she also has a private nutritional consulting business in Freehold, NJ. Kate sits on the Wellness Committee for her district’s Board of Education, and is the Educational Outreach Coordinator for her local organic community gardens. She is a member of the National Science Teachers Association, the American College of Nutrition, and the American Nutrition Association. Kate recently co-authored a chapter entitled, "Circadian Rhythms-Light/Dark Cycles," for the medical text book, Integrative and Functional Medical Nutrition Therapy: Principles and Practices, published by Springer (2018). Ribas-Latre A, Eckel-Mahan K. Mol Metab. 2016;5(3):133-52. Lim AS, Chang AM, Schulman JM, et al. Ann Neurol 2012;72:324-34. Mansour HA, Wood J, Chowdari KV, et al. Chronobiol Int. 2017;27:1-8. Feillet C, van der Horst GT, Levi F, et al. Front Neurol. 2015;6:96. Sunderram J, Sofou S, Kamisoglu K, et al. J Transl Med. 2014;12:79. Grechez-Cassiau A, Rayet B, Guillaumond F, Teboul M, Delaunay F.. J Biol Chem 2008;283(8):4535-42. Asher G, Sassone-Corsi P. Cell. 2015;161:84-92. Ando K, Kripke DF, Ancoli-Israel S. Sleep Res 1995;24:509. Wilking M, Ndiaye M, Mukhtar H, et al. Antioxidants & Redox Signaling. 2013;19(2):192-208. Auger RR, Burgess HJ, Emens JS, et al. Journal of Clinical Sleep Medicine : JCSM : Official Pub-lication of the American Academy of Sleep Medicine. 2015;11(10):1199-1236. Oike H, Oishi K, Kobori M. Curr Nutr Rep 2014;3:204-12. Kim SM, Neuendorff N, Chapkin RS, et al. EBioMedicine. 2016;7:100-11. Blade C, Aragones G, Arola-Arnal A. Biofactors. 2016;42(1):5-12. Herrmann TS, Bean ML, Black TM, Wang P, Coleman RA. Exp Biol Med. 2001;226(11):1037-44. Okawa M, Mishima K, Kanami T, et al. Sleep. 1990;13:15 23. Held K, Antonijevic IA, Künzel H, et al. Pharmacopsychiatry. 2002;35(4):135-43. Kaur T, Singh H, Mishra R, et al. Mol Cell Biochem. 2017;427(1-2):91-101. Candelario M, Cuellar E, Reyes-Ruiz JM, et al. J Ethnopharmacol. 2015;171:264-72. Huang LZ, Wei L, Zhao HF, et al. Eur J Pharmacol. 2011;658(2-3):150-5. Panossian A, Wilkman G, Sarris J. Phytomedicine. 2010;17(7):481-93. Kamei Y, Hayakawa T, Urata J, et al. Psychiatry Clin Neurosci 2000;54(3):381-2. Lewy AL, Ahmed S, Jackson JML, et al. Chronobiol Int. 1992;9:380 392.